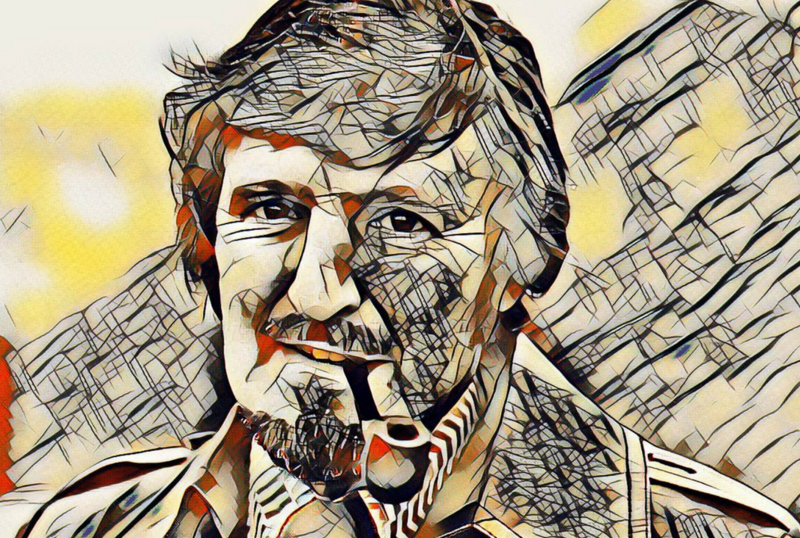 This week Jimmy Hill would’ve been ninety. If you want to know the effect Jimmy Hill had on English football, try writing its history over the past fifty years and leave him out. Much of what we now call ‘the product’ of football can be traced back to him. You could argue he has had more of an effect, made more changes and enhancements than any other individual in world football. With football being awash with money these days I am often critical of players who move straight into the media after they finish playing rather than putting something back into the game by moving into coaching or management. Well, Jimmy did both. In every sense of the word, he was a pioneer. Negotiated abolition of the maximum wage, leading to footballers being paid what they’re worth. Changed Coventry City’s colours to create the brand, Sky Blues. Introduced first all-seater stadium at Coventry’s Highfield Road. Pressed The FA to increase the prize for a win from two points to three. An initiative then adopted throughout the world. Campaigned for the abolition of the back pass. Introduced the concept of a panel of pundits for TV World Cup coverage. Was driving force behind Match of the Day, turning it into an institution. Born in Balham, South London on 22nd July 1928, his football career began at Brentford where he played under future England manager, Ron Greenwood, before moving to Fulham in 1952. He played an influential part in the club’s journey to the FA Cup Semi-Final in 1958 when he scored in every round. He once scored five goals in a game at Doncaster, in 1958. In 1957 he became chairman of the PFA and led a campaign to force clubs to abolish the maximum weekly wage. Ever since the turn of the twentieth century, the Football League set a maximum amount by which players could be paid. This resulted in clubs being able to treat players exactly as they wanted. They could determine exactly how much they wanted to pay them and were also in complete control over whether the player stayed at the club or not. In short, players were treated in a way synonymous with slavery. Jimmy Hill believed this was wrong, but the clubs were so powerful they didn’t take him seriously, to begin with. Not until he threatened a strike. This was unheard of in football. There were those who believed it would be the end of footballers in touch with the public. It divided the nation. But Jimmy was adamant players deserved to be paid their worth and some players were making the clubs a lot of money and should be appropriately rewarded. He also believed they should be free to negotiate their own contracts, much like other professions. The clubs and some of the managers were against the idea but gradually the players voted for industrial action and eventually they got their way. Many pointed to Jimmy’s influence and determination in being a key factor. The much-predicted wage spiral didn’t happen immediately, although Fulham’s Chairman, Tommy Trinder, hit upon the publicity value in handing his star player, Johnny Haynes a £100-per-week contract. But it wasn’t until players such as Jimmy Greaves and Dennis Law moved abroad that clubs realised they’d have to concede to pressure and increase the amount they were paying players. By the end of the 1960’s George Best was earning £1,000-per-week at Manchester United. When the Premier League was launched the highest paid player was John Barnes who was paid £10,000-per-week, but since then wages have exploded beyond all proportion. In the week Jimmy died there was something remarkably ironic in players of a club seeming to refuse to play for a manager so the club has little choice to sack him and find a replacement. In later years Jimmy felt the growth in players’ wages had gone too far. But then that’s a matter for clubs today rather than something he needed to worry about at the time. What is plainly obvious is clubs were pocketing all the gate receipts for themselves without rewarding the players for attracting huge crowds. The players were paid £20-per-week when the average wage in the country was £18-per-week. You can hardly blame the players for believing the clubs considered them nothing more than bit parts in the performance in the same way they did the audience. The fans weren’t flocking to football grounds for the buildings themselves, they were there to witness the performance of the players and the clubs needed to understand that. Back on the pitch, he became an instrumental part of the Fulham side which won promotion back to the First Division in 1959 after an absence of seven years. Unfortunately, he was only able to enjoy another couple of seasons as a player and at the age of 32, he had to retire due to a long-term knee injury. He’d played 276 games in nine seasons at Craven Cottage. He published his first book called “Striking for Soccer” and in it, he revealed many suggestions he had for revolutionising the game, which today have become and part and part of football, but back then were seen as something from another planet. He advocated the introduction of a super league, a winter break and regular midweek evening games played under floodlights. He also saw television playing more of a role in broadening the popularity of the game. He argued one game each weekend should be played live in front of cameras, perhaps on a Friday night. Most of these ideas are now just part of the game. In 1961 he took up the manager’s job at Coventry City, who were languishing in Division Three (League One, today). They had spent time in Division Two either side of the war but then they fell back and even spent a season in Division Four in 1958. Backed by his chairman, Derrick Robbins, he set about implementing many of his other ideas such as providing better facilities and more entertainment for supporters. He was the first man in football to really consider the spectators as customers of the club and therefore he set about improving the match day experience, something every club does these days. He introduced the first electronic scoreboard, launched the first glossy match magazine, brought in the first pre-match entertainment any ground had seen in England and provided free soft drinks and snacks for children. He continued the change of image for the club by launching what was known as, the “Sky Blue Revolution”. He changed their home kit from navy and white back to colours they used to use fifty or so years before, sky blue. He gave them their nickname and a club song, as well as organising the club’s own rail service for fans to get to away games. For the players, he lifted a ten-year club ban on them talking to the press and demanded they call him “JH” rather than sir, boss or gaffer. He did not sign anybody above the age of 25 and brought in a more analytical approach to training. In 1965 he set up the first ‘beam-back’ broadcast when City’s midweek game at Cardiff City was watched by over 10,000 supporters back at Highfield Road. It wasn’t long before improvements were seen on the pitch too, and in 1964 they won the Division Three title and then three years later, won Division Two to move into English football’s top division for the first time in their history. Their first two seasons were tough as they narrowly avoided relegation by a point each time but in 1970 they finished sixth, their best ever top-flight finish. But by this time Jimmy had stepped down as manager to take up a role at London Weekend Television as head of sport. He didn’t wait long before making changes there too. These were pioneering days for football on television and the 1970 World Cup in Mexico was going to be the first one where football showed a whole host of live games. In preparation, Jimmy hit upon the idea of a panel of pundits to debate what they were about to watch and then chew the fat over what they had just seen. Ever the visionary, Jimmy soon understood the effect of having some big personalities and egos in the studio together, would have on the viewing experience for those at home. The arguments between Derek Dougan, Malcolm Allison, Paddy Crerand and Bob McNab became compulsory viewing and the format has been retained ever since. Jimmy was one of those visionaries who could see the impact television was likely to have on the game and this was where he concentrated his energy. In 1972 he moved back to the BBC to present Match of the Day. The programme had begun in 1964 but spent much of the sixties convincing the clubs it was not going to steal their audience. Jimmy again brought his creative juices to the concept and encouraged slow-motion replays, using them as a way of showing goals as well as illustrating certain key moments in a game which may garner discussion for the watching public. Jimmy would often criticise refereeing decisions and was able to use television to prove his theories. In a time when live broadcasts of matches were still confined to the FA Cup Final, England v Scotland and the odd international match, Jimmy was one of the first to be used as a summariser during a match. But not in a way where people today talk almost as much as the commentator, but during the cup final he would be asked his views on how the game was going about every fifteen minutes. The 1983-84 season saw the advent of another of Jimmy’s ideas when Match of the Day showed a live league match on the BBC for the first time. It was two months after ITV had shown theirs but still, Manchester United v Tottenham on 16th December 1983 was historic at any rate. During his broadcasting career, Jimmy returned to Coventry as managing director and eventually becoming chairman. In 1981 Jimmy’s proposal to convert Highfield Road to an all-seater stadium was realised. It was the first ground in England to move to all-seater and given what was suggested by the Taylor report in 1989, it was another example of Jimmy being ahead of his time. Unfortunately, the all-seater project was abandoned two years later when standing room was re-instated. What hadn’t helped the plan was Leeds fans ripping out several hundred seats just months after they’d been put in. When Highfield Road closed its doors for the last time in 2005, Jimmy received a hero’s welcome from the crowd and fans voted for a bar at the new ground, Ricoh Arena, to be named “Jimmy’s” in his honour. Unlike today where Match of the Day pundits watch all live matches at the same time from a control room at the studios, when Jimmy was preparing for the programme he had to be at a ground to be able to summarise it that evening. Often he would get a private plane to fly him back to the studio. During one match at Highbury in September 1972, the linesman pulled a muscle and couldn’t continue. As the match couldn’t be continued without a qualified official there was an appeal over the tannoy to see if anyone in the crowd could help. Step forward Mr Hill, who confirmed himself to be a qualified referee and so he donned a sky blue tracksuit and ran the line. At the beginning of the 1980’s, there were discussions around how to improve football and raise the attendances at league grounds. One of Jimmy’s ideas was to change the points awarded for a win from two to three. He argued many matches can end up turgid, dour affairs with neither side wanting to make a mistake and risk losing the point they were on course for. Jimmy’s suggestion promised to offer a greater prize for the side willing to give it everything right up to the final whistle, turning one point into three. In 1981 the FA formally adopted the new system for league matches. Few major nations followed until Italy brought it in, in 1993 and then UEFA used it for the Euro ’96 qualifying campaign. Nowadays it is used globally around all leagues. When Coventry City won the FA Cup in 1987, their only major honour ever, joint managers George Curtis and John Sillett were keen to point out the excellent groundwork Jimmy put in which they believed had gone a long way to contributing to the club’s success. Both Curtis and Sillett were players at the club when Jimmy was manager. Having never ever been in Division One until promotion in 1967 under Jimmy’s management, Coventry then spent thirty-four seasons in England’s top division. By the time they eventually succumbed to relegation, in 2001, only Arsenal, Everton and Liverpool had spent a longer unbroken spell there. He returned to Fulham as chairman in 1987 where he staved off the threat of bankruptcy and a merger with Queen’s Park Rangers before setting the club up for a more successful period under new owner, Mohamed Al Fayed. He was awarded the OBE for services to football in 1994. In 1999 Jimmy moved from the BBC to Sky Sports and fronted a new programme, Jimmy Hill’s Sunday Supplement, a weekly discussion between Jimmy and three football journalists conducted over breakfast. He chaired the programme for six seasons before his co-presenter, Brian Woolnough took over and Jimmy was no longer a regular on our screens. Some may have viewed Jimmy by then as a man of the past, a dinosaur, stuck in the past. In fact, during his broadcasting career, he was continually criticised for his outspoken views. Yet this is what attracted the viewers and after all what is the point of a television programme if you cannot get anyone to watch it? Above all, Jimmy was ridiculed for his chin which protruded somewhat. In fact, when I was at school there was a fashion to rub your chin when you were being told something you didn’t quite believe, saying ‘Jimmy’ in a rather sarcastic voice just to confirm the disbelief. Des Lynam recalled, “we were at a ground and all 30,000 people started chanting at him, but not quite in his favour. I asked him how he put up with it and he simply said ‘that’s fame for you’. He was not going to be beaten by a chanting crowd”. For a man who achieved so much in football, it must have appeared odd why he would be subject to such ridicule but Jimmy clearly loved the game and seem to revel in any debate about it. Shortly after his final appearance for Sky Sports, he was diagnosed with the early stages of Alzheimer’s. This seems a particularly cruel disease for a man with so much to be proud to remember. His last public appearance came in 2011 when he unveiled a statue of himself at the Ricoh Arena. In 2012 he was moved to a nursing home where he spent his last three years. Jimmy Hill died on 19th December 2015 aged 87. He can honestly be considered to have lived a full life and much of it in the service of others. His love of football was obvious and whether you agreed with him or not, you cannot deny he had the game’s best interests at heart. All footballers these days owe a debt of gratitude to Jimmy every time they negotiate a new contract and look at their bank balance. Every supporter who enjoys the comfort of a matchday experience can largely tip their hat to Jimmy for having the foresight to consider them when other clubs were just content to pack as many people in for the match itself. When you watch coverage of football from the comfort of your home, you can thank Jimmy for pioneering many ideas to improve the viewing experience. There are many other things for football to be thankful to Jimmy for and we will never know what might have been had he not been around. Given the events at FIFA recently, one feels certain the organisation would not have got into such a mess had he been involved. His sense of fair play and concern for the paying spectator would have given the international game a completely different look. As it is we can be thankful for being around when Jimmy was and thankful there are people who can relay his story. In a time when football and footballers have never been richer, football is poorer for his loss.